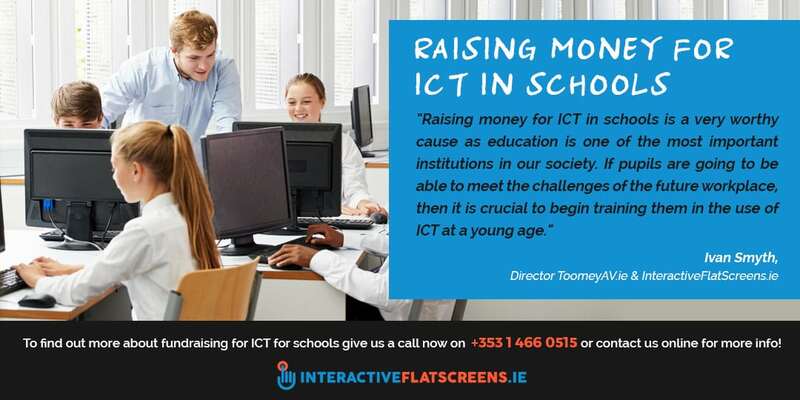 InteractiveFlatScreens.ie & Toomey AV works closely with Kevin Rowe Events to help schools fundraise for ICT (Information Computer Technology). We provide the AV rental for these fundraising events and then help to kit out the schools with ICT equipment. 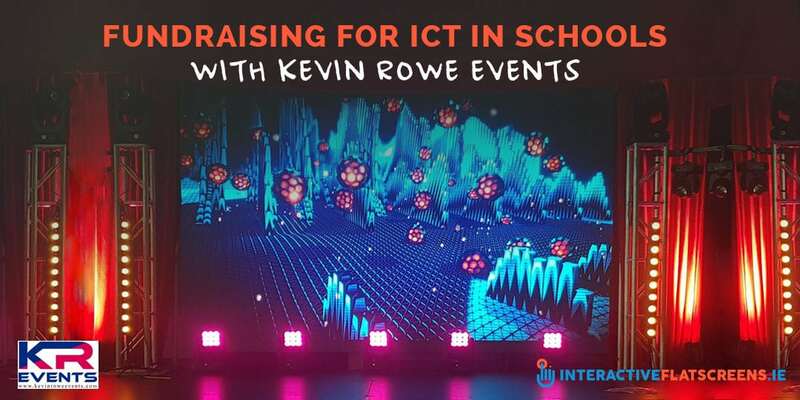 In the past we’ve discussed how to apply for the €5k ICT grant and this post will go over fundraising for ICT in schools with Kevin Rowe. As far as fundraising events go, there is no limit to how creative you can be. The sky really is the limit. Kevin Rowe Events is there to help make it happen and Toomey AV & InteractiveFlatScreens.ie is proud to partner with Kevin Rowe in this. Creative fundraising often involves a show and ‘showing’ is what Toomey AV all about. This is our territory. Probably the most common creative fundraising event is the talent competition. With over 25 years in the business, Kevin Rowe, in partnership with Toomey AV, is the no.1 choice for making your talent show happen successfully. There are three types of talent show events that Kevin Rowe specialises in. The ‘OsKaRs’ involves Kevin Rowe training up people in how to act and make movies. The movies are made and then the school has its own gala OsKaRs night. ‘Lip Sync’ involves competitors taking on the persona of their favourite act. Again, Kevin Rowe trains the participants and then produces the show on the night. ‘Strictly’ involves participants being trained by professional dance coaches with Kevin Rowe producing the show on the night. Not only is it a good way to raise money, creative events are a good way to instill confidence and self-esteem in participants. It also helps foster a sense of identity amongst pupils, be they on stage or in the audience. And it reinforces a feeling of pride, morale and solidarity amongst everyone involved: teachers, pupils and parents. So, there is more to it than just raising money and Kevin Rowe Events understands this. They know how much you want your event to succeed, not just in terms of making money but as a show and a social occasion. Raising money for ICT in schools is a very worthy cause as education is one of the most important institutions in our society. If pupils are going to be able to meet the challenges of the future workplace, then it is crucial to begin training them in the use of ICT at a young age. A school that is deprived of ICT is a poor school indeed. Of course, education is not purely about preparation for the work place. But even more traditional subjects such as English and History can benefit enormously from being taught through ICT. 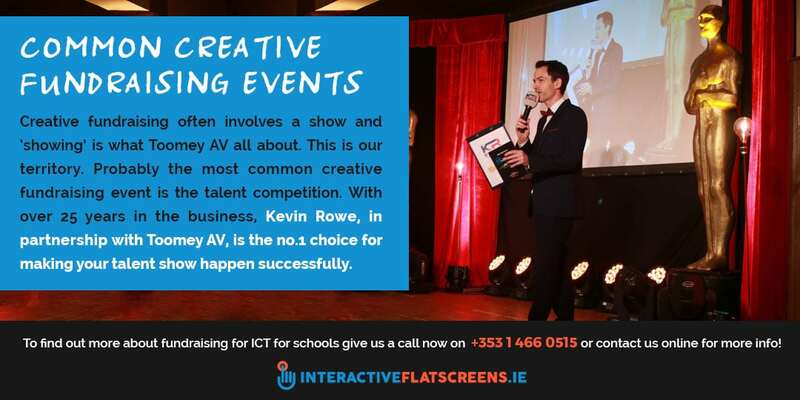 InteractiveFlatScreens.ie & Toomey AV is proud to play its part in bringing ICT into the classroom, especially through fundraising by partnering up with Kevin Rowe Events in delivering a wholly successful and memorable show. If you’d like to find out more about planning a fundraiser for your school then get in touch!